These ministries and organizations, many of which are affiliated with the United Methodist Church, work toward public support or recommendation of a particular cause or policy. Some of these organizations are agencies of the global United Methodist Church but also have committees that operate within the conference. Bread for the World is a collective Christian voice organized to urge our nation’s leaders to end hunger at home and throughout the world. The Commission on Religion and Race (CORR) of the UMC strives to fight racism through institutional equity, vital conversations, and intercultural competency. The Commission on the Status and Role of Women (COSROW) of the UMC works toward full and equal participation and responsibility of women in the church. Contact cosrowumc@gmail.com (global) or fayechris@brainerd.net (Minnesota). The General Board of Church and Society of the UMC provides public witness and advocacy in an effort to bring healing in the midst of strife, justice in the midst of brokenness, and love in the midst of hate. Justice for Our Neighbors (a UM ministry) advocates for immigrants on issues of social justice. Metropolitan Interfaith Council of Affordable Housing (MICAH) works to expand affordable housing in the Twin Cities. The Committee on Native American Ministry (CONAM), (formerly known as NAMAT) of the UMC cultivates and supports missions with Native Americans in Minnesota. The Palestine-Israel Justice Project of the UMC promotes understanding of the Palestine-Israel conflict and its impact on society. 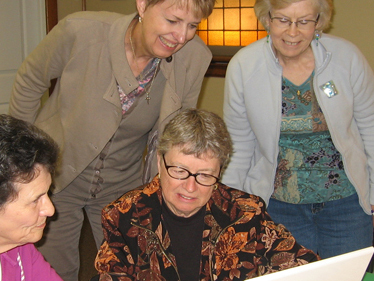 United Methodist Women (UMW) advocates for economic, environmental, global, immigration, and racial justice, and women’s rights issues; works to eliminate domestic violence and human trafficking; works in areas of education and health care, particularly for women and children in 114 countries; and hosts a week of learning, called Mission u, every summer.